AWS - a worldwide authority institution in the field of welding, the CWI certified by AWS possesses a very high reputation in the field of international welding fabrication and is recognized widely in the field of welding engineering project. Foreign customers always regard whether there are CWI personnel as an important point to check an enterprise personnel’s qualification and sometimes as a necessary condition of ordering for goods. With the related certificate to show the value and abilities and to show to the society of the enterprise itself has become a feature for inviting application for jobs, applying for jobs and improving personnel one self’s ability. The candidates who have passed the test will be certified by AWS as CWI and become elite in the field to be assured his own ability and level. Improving capacity and manufacture efficiency meanwhile keeping the technology and quality at an ideal level. Certified CWI will possesses a card，certificate, a stamp and be registered by AWS global AWS registration system. The registered CWI names will be present to AWS magazine <Inspection Trend> in order to be checked by related personnel. Related recent working experience has been required when you need to renew certificate so that the CWIs have long-term competition advantages. Welders, technicians and engineers can become CWI by training and tests. Once getting this certificate, you will face more chances. By audited and authorized by AWS, SWS began to hold CWI training, testing and certifying since 2009 to offer the most reliable training, testing, registering and certifying services. SWS have a lot of advantages in the field of CWI training: the teachers have rich experience in the field of welding technology, workmanship and inspection. The material for CWI training has been carefully translated and examined and approved manuscripts by the experts of SWS to make the teaching material more accurate. Abundant training material convenience the candidates greatly for their training. According to training requirements of AWS, SWS strengthen training for whole week (details below). Special training for candidates offering them with widening knowledge, technology and be familiar with several international facilitation, inspection, test criterion and technology requirements and make enough preparations for taking part in CWI tests. If you need to learn more about CWI training and examinations, please visit www.shws.org, check out our CWI training & examination program and download the application form. After filling the application form, you can e-mail or fax them to us. Make sure the application form with required signature and stamp, then submit the relevant supporting information. You can choose whether to participate in training courses, but SWS think that it can greatly increase the possibility of passing the exam by strict training. Part B can also be individually selected visual inspection programs. Please contact SWS for the Price. Three days on all facets of welding processes and nondestructive inspection etc. This course continues to be refined and sharpened through attendee evaluations and by examination performance. 3) Metal Joining and Cutting Processes. 4) Terminology and Weld Joint Geometry and Welding Symbols. 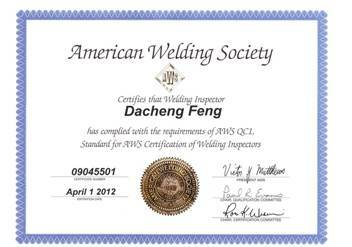 5) Documents Governing Welding Inspection and Qualification. 6) Metal Properties and Destructive Testing. 9) Evaluation of Weld and Base Metal Discontinuities. 10) VT and Other NDE Methods and Symbols. The eight hours of instruction provide a "road map" through the Code, emphasizing the ability to locate important paragraphs, charts and tables quickly, which is necessary to one as a CWI. In addition to practice questions, a practice exam will be administered, and the instructor will illustrate the use of the Code under time constraints, creating deadline pressure similar to the test environment. If you're taking the CWI exam, this clinic has proven to be valuable test preparation. As a leading structural code, D1.1 is the ideal tool to teach effective code use. √ How to correctly interpret specifying documents. √ Surefire methods to avoid common pitfalls with any code. √ The proper terminology that gets you the right section of the code -- quickly. √ How to use any code, standard or specification by understanding the core of the problem or question. This course covers general code provisions, including qualification of welding procedures for welds containing filler metal additions, design and preparation of the joint for production welding, nondestructive testing and acceptance standards, and automatic welding with and without filler metal additions. Attendees will practice open codebook testing under time constraints. √ API 1104 testing requirements and acceptance criteria. √ The proper terminology that gets you to the right section of the code ­ quickly. This workshop provides eight hours of expert instruction that includes approximately three hours of instruction in the use of inspection tools, followed by "hands-on" learning to inspect a weld for accepting or rejecting according to a certain standard. This hands-on training incorporates plastic replicas of welds and also includes a sample practical examination to prepare test candidates for the CWI practical exam - part B. 1) How to use weld measuring instruments. 2) Understanding and familiar with the details of certain specification. 3) When a discontinuity is OK.
4) When a defect is rejectable. 5) Why visual inspection can be the most effective NDE technique. Part A: Fundamentals — Closed book test; 150 questions. Part B: Practical — Hands-on test; 46 questions; use Book of Specifications. Part C: Open Code Book — Open book test; 50-60 questions on the code you previously selected.